German composer and barytone singer; born Feb. 18, 1850, at Breslau, where he studied with Wandelt and Schäffer. He made his first appearance as a pianist at twelve years of age. At the Leipsic Conservatorium (1867-70) he was a pupil of Wenzel and Moscheles (pianoforte), Götze (singing), and Richter (theory and composition). Subsequently he studied in Berlin under Schulze (singing) and Kiel (composition). After making several concert tours through Europe, in 1877 he went to England, where he lived for three years. In 1881 Henschel became conductor of the Boston Symphony Orchestra, at Boston, Mass., and he retained the position till 1884. In 1885 he settled permanently in London, where in the following year he founded the London Symphony Concerts. From 1886 to 1888 he was professor of singing at the Royal College of Music, London. 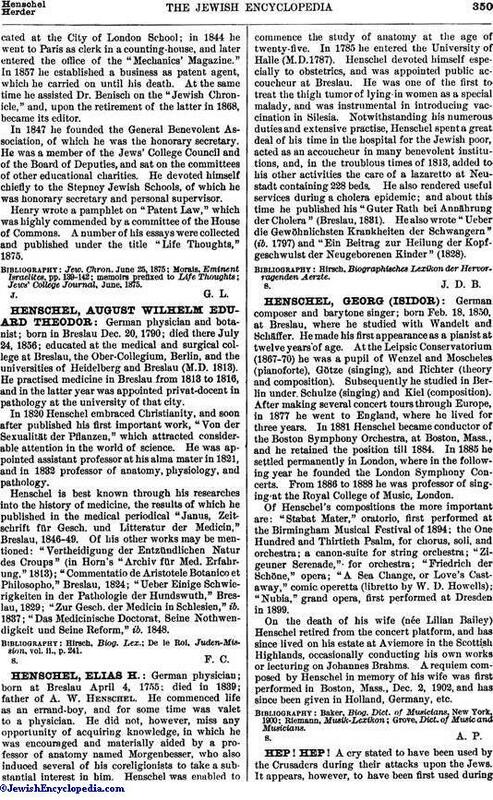 Of Henschel's compositions the more important are: "Stabat Mater," oratorio, first performed at the Birmingham Musical Festival of 1894; the One Hundred and Thirtieth Psalm, for chorus, soli, and orchestra; a canon-suite for string orchestra; "Zigeuner Serenade," for orchestra; "Friedrich der Schöne," opera; "A Sea Change, or Love's Castaway," comic operetta (libretto by W. D. Howells); "Nubia," grand opera, first performed at Dresden in 1899. On the death of his wife (née Lilian Bailey) Henschel retired from the concert platform, and has since lived on his estate at Aviemore in the Scottish Highlands, occasionally conducting his own works or lecturing on Johannes Brahms. A requiem composed by Henschel in memory of his wife was first performed in Boston, Mass., Dec. 2, 1902, and has since been given in Holland, Germany, etc.